The gf and I had talked of going abroad, maybe France, Spain or some other European destination. When we compared a UK holiday to some of the advertised European holidays it seemed Europe would be cheaper! That is, of course, if you can travel outside of the school holidays. The gf’s kids are growing up slowly but surely, but they’re not quite at the “fend for yourselves for a week” stage just yet. Dammit. In which case the UK does seem more cost-effective in the high season. The gf had spent quite some time looking for somewhere new, adventurous, romantic and yet affordable, and had achieved diddly-squat. Finally after one full day spent looking for the perfect holiday she became very angry, so I collected the responsibility. Of course I did not want to disappoint her and spoil a rare holiday together, but I also realised that on a limited budget I was not going to achieve perfection. I sat there for a while, looking at the UK on Google maps. I’ve been to Scotland this year, nope, Cornwall’s just too far and we went there last year, nope, Wales is close by and very beautiful, but perhaps too close and too obvious, nope, Derbyshire’s nice but for some inexplicable reason I want to go to the coast, nope, East Anglia’s too flat, nope, The Lake District will be packed solid, nope. I’m starting to see her problem. I looked at Static Caravans, Hotels, Yurts, Guest Houses and Camp Sites. 3 Hours later, I made a decision. The East Coast. 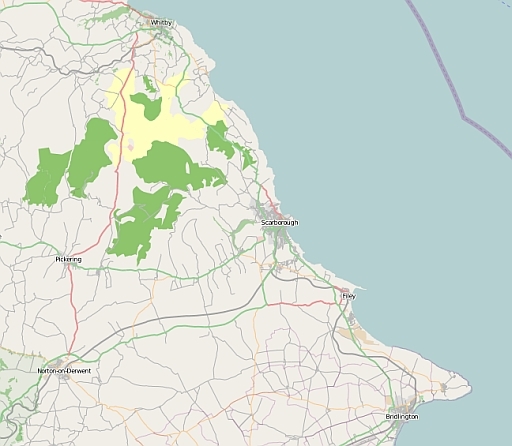 The North Yorkshire East Coast to be more precise. I have indeed been to Flamborough Head, Scarborough, Whitby and Bridlington before, but not for at least 10 years, probably more. It’s far enough away to feel like I am on holiday yet not so far as to require a long drawn out trip that will take 2 precious days off my holidays. Now all I need to do is decide where to stop. There are countless websites advertising countless hotels and guesthouses in the area. I spend another 2 hours reading reviews and comparing prices until I finally lift the phone to make a booking. 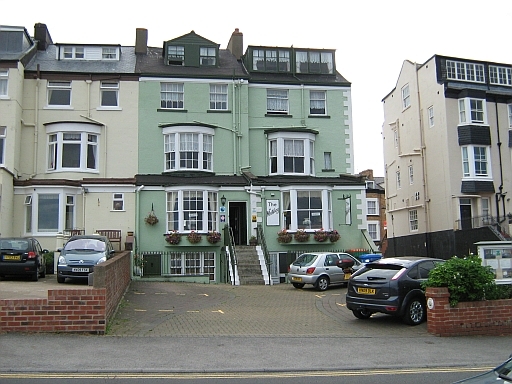 Due to the holiday only being 2 weeks off most places are partially or fully booked, so I end up with Sunday, Monday and Tuesday night booked into a hotel in Scarborough, then Wednesday and Thursday night in a guesthouse in Whitby. Upon reflection I’m happy because this means we don’t spend too long in one place and it’s only a short ride from Scarborough to Whitby anyhow. The next thing I do is inform the gf we are booked, but I decide not to tell her where! How do you keep an idiot in suspense…I’ll tell you later. I tell her we are booked into guesthouses in the UK so she knows what to pack, other than that I tell her nothing. I get the impression she’s quite excited, more so because the destination is a surprise. I prey she’s not too disappointed. Finally there’s the bike to sort out. The Fazer’s just fine, except for those damn fancy and quite unnecessary front brakes. Why the devil did Yamaha choose to fit super-sport R1 brakes that require relentless maintenance on a roadster like the Fazer? Another careful session of cleaning the pistons with brake fluid whilst avoiding the paintwork eats another hour of another precious evening. I get the front wheel to turn with minimal binding but it’s far from perfect. 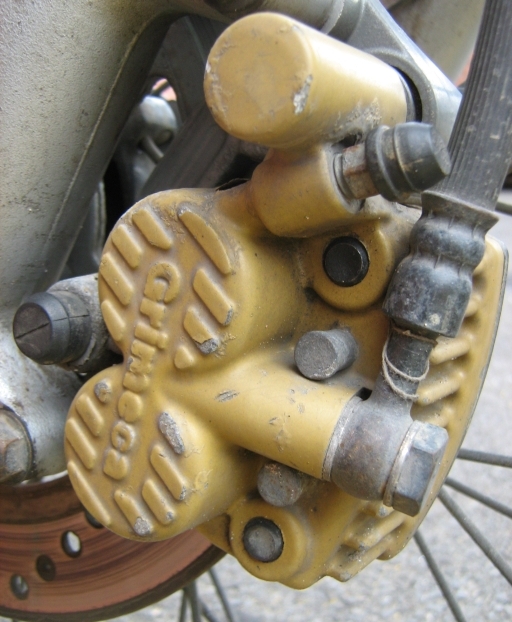 What’s worse is the cheap Grimeca brake on the 125 works powerfully and progressively, never sticks and has non-rusting pistons! I’m packed, I’ve been packed for days actually. It’s nice to be packed so light, seeing as we are not camping. On the motorway to the gf’s the bike feels smooth and the weather, although grey, is dry which is better than the forecast. I’m rather excited myself although I don’t know why. Scarborough and Whitby, come on, it’s not exactly the Riviera or the Grand Canyon is it. Still, it’s a week off work and a week off the treadmill of everyday life. I am concerned as to what the gf will make of my choice though. EEEK! There’s only one way to find out. I’ve already given the saddlebags to the gf, with a strict rule that if it’s not in the saddlebags, it’s not going. She tells me they’re heavy. She’s right. I imagine I’m a cowboy in a western movie, I throw the bags onto the horse and the horse collapses under the weight. The Fazer however simply drops a millimetre when I haul them on. 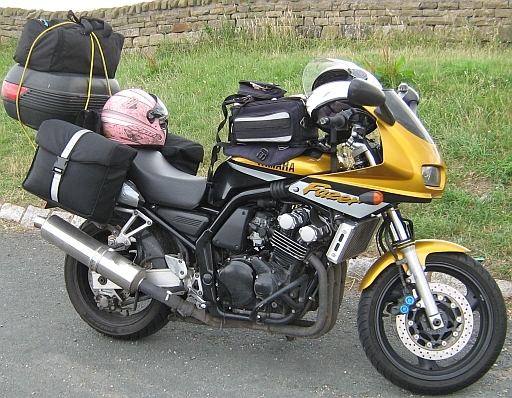 On the road with the gf and the saddlebags, my bag and a few items in the tank bag the bike feels heavy, but nowhere near as heavy as it has been in the past, it feels just fine. This...is actually quite a light load compared to a camping trip. The first part of the trip takes us on the motorway back in the direction of my house. I wonder if the gf thinks I’ve booked 5 nights at my house as a special treat. I can almost feel the relief in her body as we pass my junction and carry on. Another 30-something miles later we take a short toilet break at Hartshead Moor Services on the M62. By this time my geographically challenged gf has worked out we’re heading to Yorkshire, but where is still a mystery. Another stretch of motorway leads us into white clouds with occasional breaks, but no sunshine yet. Junction 37 takes us off the motorway and it’s easy to follow the signs for Bridlington. Here the land is most definitely arable. Rolling farmland is covered in now golden crops that await harvesting and the towns here are much smaller. I laugh childishly when I see a sign to “Wetwang”. There’s little traffic and I’m really enjoying a gentle pace. All the signs point to Bridlington. By now the gf must surely think the destination is Bridlington. Then I see a Scarborough sign and head north. This road is a little narrower and although it’s not sunny the air is warm and the riding is good. I sweep a few corners and allow myself a short blast before calming down as we pass through the next town. Oh rose tinted glasses. I remember Scarborough as a big place, but not this big! We pass industrial estates, shopping estates and housing estates before we reach the bustling town centre. Luck is on my side however and a sign for the North Bay takes us quickly to the coastal bluffs where I know our hotel is situated. After a quick check on the map I get my bearings and find the hotel. The Whiteley Hotel on Queens Parade. All the hotels are the same up and down the road. Queens Parade is on the North Bay of Scarborough. It follows the bluffs that overlook the beach and promenade and is made up of countless small hotels. They are not classed as Guesthouses as that implies a few rooms in a regular house. Most of these hotels have over 10 rooms and some have their own bar. In the Whitely where we are staying there are 5 floors if you include the basement, but they all have 5 floors. We are on the top floor. That’s a flight of steps to the entrance and 3 more flights to our room. It’s a fair hike up there, it’s a hell of a hike when carrying them bloody saddlebags I can tell you! We settle in. The room’s fine and apart from the climb the hotel is basic but fine too. It’s mid-afternoon now so we take a siesta, you might call it a nap. By tea-time we walk into the edge of town and spot a chippy for tea. We spend the rest of the evening watching TV, relaxing and doing what comes naturally to young people…if only we were young people. I nip out at 2100 to seek pop and chocolate. This being a Sunday night I walk in vain all around the town and find nothing. Despondent I return to the hotel and pass a shop that looks closed until someone emerges. I’ve walked for half an hour to find the only shop that’s open is 2 minutes from the hotel. To cap it all, upon my return the gf complains I’ve only purchased one of her favourite bars, she wanted two.